I’ve been travelling around a bit lately, sharing my story and answering many wonderful (and sometimes unusual) questions. I can’t get to everywhere, so I was delighted when Kelly – from a Cheltenham Book Club – got in touch with me. We have some questions for you, from our recent book club meet at The Suffolk Anthology, Cheltenham. Love for the Chocoplot was unanimous and we all enjoyed its humour and language play- like the alliteration and neologisms. A favourite part was when Jelly and her Gran were in the ball pit, trying to escape. Dodgy Dave had his mention, too! Thanks Kelly – I had to look up ‘neologisms’ and am going to try and add it to my next conversation – I’m sitting in my chair with the lights dimmed, let the questioning begin! Why was Garibaldi Chocolati called ‘Choccy Biccy’? I’ve always loved making up names and wanted something fancy and elaborate for Garibaldi. But people are not always called by their proper names, and nick names can be a lot of fun. A garibaldi is an old fashioned biscuit and Chocolati is obviously a play on the word ‘chocolate’, so I thought that he could be nick named ‘Chocolate Biscuit’, which could be shorted to ‘Choccy Biccy’. I love a choccy biccy with a cup of coffee! How long did it take to write this AMAZING book? Thank you Nancy and Emme for those lovely words, I’m glad you enjoyed it! I had the idea of a ‘Chocopocalypse’ rattling around in my head for a few months and I would occasionally jot down some notes. I quickly had fully formed story and decided to write it as a Christmas present for my daughter. I started writing it in the school summer holidays and had a first draft ready for Christmas – so about 4 months. Then I fiddled with it for a bit, before a publisher said they liked it and we started the long job of editing. This is all about adding some parts, taking away characters or scenes that don’t quite work and generally playing around with it. Two years after I gave the first draft to my daughter, it was published and available in bookshops! It seems like a very long time, but lots of writers work on their stories for a lot longer!! Has your Gran got a Granavan and do you like chocolate? Neither of my Grans had a Granavan, Evie. But they were both lovely people and I wanted something similar for my story. I needed Jelly’s Gran to live quite close to them – so she could pop in and out when needed – but I didn’t want her living there. Me and my daughter would often walk home from school passed houses with caravans on their drive. We always wondered if anybody lived in them! So I thought this would be a nice idea for the story. And do I like chocolate? Oh, yes. Definitely, yes. Very much! Is chocolate going to run out? That’s a good question, Ellen. And a worrying one! There are some people saying that there is a real problem with chocolate crops! I can’t give a definite answer to that I’m afraid. It’s up to you to decide for yourself and maybe investigate ways to make it stop happening. I have an environmental past, and I honestly believe we can change things and make the world better. Have you been to Mexico and did it inspire your story? I’ve never been to Mexico or South America, where the origins of chocolate are said to have begun. But it is a place I’d love to visit. I’ve always been interested in ancient civilizations like the Romans, the Greeks and the Mayans (from South America). The Mayans, in particular seemed to like their prophecies and I’m sure that’s where I got my ideas from. Oh, this is a hard question. I don’t have an absolute favourite bar. I love the variety that you can get. Some days I’ll be in the mood for some chocolate with crunchie bits in it, or soft, chewy bits, or just a simple block of solid chocolate. There is a type of chocolate for every taste – which is another reason why we all love it!! Did you base the Chocka Chocolate on a real brand of chocolate? If so which one? 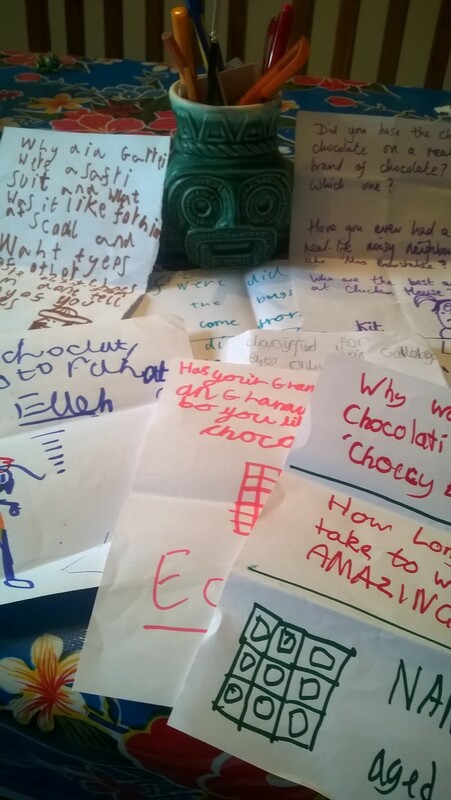 I didn’t want to use any real chocolate in my story (I probably wouldn’t have been allowed – although there is a quick mention of Rolos!) and I love to make up names. 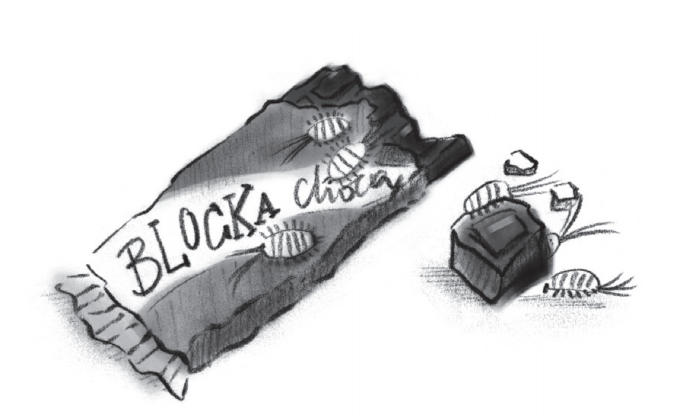 One bar of chocolate was mentioned a few times in the story: Blocka Choca. For a long time, this was called a Chocka Blocka, but I found a very similar named bar and didn’t want to use something that already existed. So very near the end I swapped the words around to make Blocka Choca, which I like better. It sounds like a block of choca, which fits in well with Sir Walter Waffle’s block of chocolate statue. Are you wishing there was a Kit Kat, Kit? Kit Kat Kit!! I’m a sucker for a silly alliteration! Who are the best authors at Chicken House? Blimey, what a question! How do I answer that? I couldn’t possibly say who the best are, but I can say what a privilege it is to be with the same publisher as so many talented writers. I’ve been lucky to meet a few too. Kieran Fanning is a fantastic writer of adventure stories, Dan Smith writes amazing thrillers, there’s the brooding Darkmere by the wonderful Helen Maslin, I loved Emma Shevah’s Dara Palmer and Linda Davies’ exciting Longbow Girl. But there’s also Sarah Rubin and her super clever Alice Jones and I’m sure everyone has heard of James Dashner’s Maze Runner. I could go on and on! Maybe you should check out Chicken House’s website, there are fab authors for everyone. 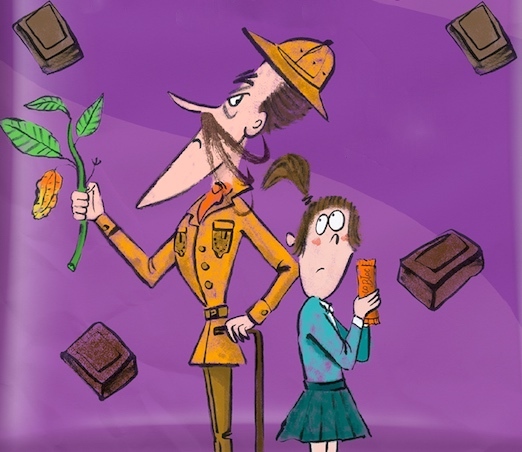 Why did Garibaldi wear a safari suit and what was it like for him at school and what types of other chocs are there..
From Sam, don’t tell any of your mates. Don’t worry Sam, I won’t tell my mates! Garibaldi has travelled all over the world searching for pure chocolate and is quite a snob. So, I thought he would get dressed up in a snobby way. He likes to think he is better than everybody else and has old fashioned ideas – so an old fashioned safari suit that old explorers used to wear seemed to suit him well. I imagine he was quite snobby at school too and wasn’t very popular. He probably ran the school’s tuck shop (do schools still have little areas where pupils can buy chocolate, crisps and pop at lunchtimes? Probably not!) and like to think he was in charge of all the chocolate in his school! Other types of chocolate? There is so much to choose from and so many varieties – which makes Garibaldi’s blood boil! Where did the bugs come from and why did Garibaldi Chocolati wear a safari kit? Yes, these bugs are a worry aren’t they Alfie! And they are REAL! Ants and mealy bugs have been linked to problems with chocolate crops for a while now. Hopefully this is being dealt with, but it may be something we need to keep an eye on! Have you ever had a real life noisy neighbour like Mrs Bunstable? Oh dear, I could get into serious problems if I told the truth here!! I have been very lucky – mostly – and had great neighbours in the past. But I’m sure many of us have had a problem neighbor before (ask you Mum and Dads, I’m sure they’ll have stories!). I had a great time writing this character, and there might be a few people who recognize her! Thanks so much for agreeing to answer all of these fab questions, it’s really kind of you. You are very welcome. They were all great questions and thank you to all the Book Clubbers for taking the time to read my book. It makes me so happy to know that people have enjoyed my silly story.